Tim grew up in the Savannah area and began working in the crane industry when he was 15 years old. He started out sweeping the ﬂoors and running errands. He worked up to crane oiler, operator, rigger, dispatcher and Company CEO. Tim opened Tim’s Crane & Rigging in May 1997. He began this company with 4 rented cranes and 4 operators. The company now consists of 24 cranes ranging in size from 8 Ton up to 300 Ton. 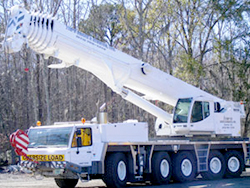 The ﬂeet includes All-Terrain, Crawler, Hydraulic Truck, and Conventional Truck Cranes and Boom Trucks. The company has over 24 operators, most with over 20 experience years and are CCO certiﬁed. The company was founded on Tim’s desire to give customers quality service at competitive prices. 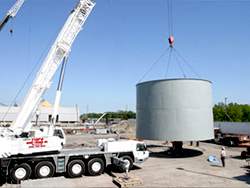 Tim’s Crane & Rigging is dedicated to the safety of its personel, customers, and the public. A safety program is in place and is continuously being updated and improved upon. We maintain a Substance Abuse Program (new hire, random, accident). The company is centrally located one mile off of I-95 in Chatham County. This location enables the Company to service Hilton Head Island, Bluffton, Downtown Savannah, Brunswick, and surrounding areas in a timely, efficient manner. The company is a member of the Savannah Area Chamber of Commerce and Specialized Carriers & Rigging Association.